Still looking for a perfect set of KPIs? Look for a keystone habit! It works as a leverage, it starts a chain reaction and creates a cultural shift towards the performance excellence in a company. What if someone were to tell you that to improve the overall performance of your company, you need to focus all your efforts on … worker’s safety? Your current safety indicators are in the green zone and their values are even better than the ones all over the industry. What a surprise when a new CEO is talking to the investors and shareholders not about ROI, investments, and financial efficiency, but about … safety. That’s what Paul O’Neill did when he came to Alcoa in 1987 as a chairman and CEO. Alcoa deals with a molten aluminum, and their injury rate per 100 worker per year was 1.86 (quite good compared to the national rate in US that was 5 incidents per 100 workers). The new CEO established a goal – “achieve zero injuries level” at the organization where people handle molten metals. Did the company achieve this goal? Today Alcoa publishes their safety data in real time, when I was writing this article the rate was at 0.120. In other words, on average, workers at Alcoa take less of a risk in getting injured than employees of a software company or a legal office. How did this company do this? They became “obsessed” with safety! Any safety incident was reported within 24 hours to the management. The reports contained an analysis of the situation, and the prevention plan for the future. They were really serious about it, and one top manager was even fired for not reporting a safety incident. Safety was not just a part of the bureaucratic reports, it was in the focus. There was always a budget for improving safety – from installing new sensors and proactive maintenance to training people about safety; they even implemented email system to … report about safety problems more efficiently. There was a “side effect” of this focus. People started sharing other ideas and some of them lead to some significant process improvements. And more important, the financial results of the company were improving as well. To learn the full story you can start with this article by Pulitzer Prize–winning business reporter Charles Duhigg. If you liked the story, I do recommend reading a book, where Charles Duhigg explores the nature of habits (or their business analog – routines) by giving some great examples of how to improve organizational performance. The term “keystone” came from architecture, where it was the final piece placed in an arch that supported the weight of the whole construction. The term is often used to underline the importance of the dependencies, for example there are keystone species that significantly impact on the ecosystem and other species. Can create a cultural shift. Food journaling or daily exercise that for some reason cause people eat healthier food and change their financial habits as well. Are there some other keystone habits? I do agree and I suggest that organizations and persons need to find a keystone habit that is applicable in their very own case. For example, why not take “happiness” as a keystone habit? Tony Hsieh, CEO at Zappos and author of “Delivering happiness” argue that using the happiness of employees and customers as a principle can actually help leaders to guide the company along the way towards long-term success. If “happiness” doesn’t sound like a word that one uses in daily business talks, then replace it with “trust.” Think about achieving trust by creating reliable customer service with a fast response, and building relationships with employees and partners. How to find a keystone habit for a business? Most likely it will replace some old (bad) habit/routine. What might be the best way to be respectful with a customer? Give them a high quality product or service. Not just fix the problems quickly, but think about the reasons for these problems and prevent them in the future. Give them reliable customer service. Update your website with some fresh information; train managers at the call center; think about user experience. Hire sales people that educate, not those that repeat marketing pitches. Be respectful with your internal customers (your team). Boost engagement by giving them the best tools and training, cultivate a culture of excellence. I like to share Alcoa’s story as an example when someone is asking about a good KPI for a certain aspect of their business. The lesson that we can learn from it is that it is necessary to do a root-cause analysis and look for the patterns that can work as a performance leverage. 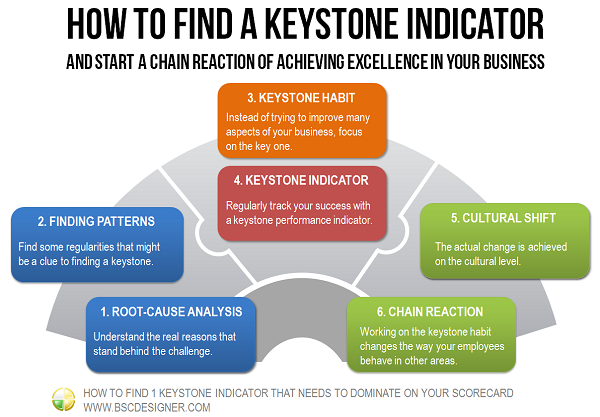 How does the keystone habit look in your business? How did you find it? ^ Zero Is Possible, Alcoa Worldwide website. ^ How ‘Keystone Habits’ Transformed a Corporation, Charles Duhigg, 2012, The Huffington Post. ^ The Power of Habit: Why We Do What We Do in Life and Business, Charles Duhigg, 2014, Random House. ^ Delivering Happiness. A path to profits, passion, and purpose, Tony Hsieh, Business Plus, 2010. Book’s website. ^ Paul O’Neill interview worker safety at ALCOA.